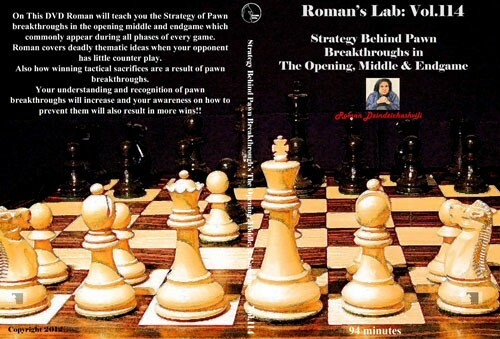 On This DVD Roman will teach you the Strategy of Pawn breakthroughs in the opening middle and endgame which commonly appear during all phases of every game. and Also your awareness on how to prevent them will result in more wins!! Vol.114 Stategy Behind Pawn Breakthroughs in the Opening , Middle & Endgame 94 Minutes On This DVD Roman will teach you the Strategy of Pawn breakthroughs in the opening middle and endgame which commonly appear during all phases of every game. Roman covers deadly thematic ideas when your opponent has little counter play. Also how winning tactical sacrifices are a result of pawn breakthroughs. Your understanding and recognition of pawn breakthroughs will increase and Also your awareness on how to prevent them will result in more wins! !